First floor of Ginza 9 Bldg, First Annex. GINZA GALLERY Kogei Murata. Tokyo has different sections, just like New York's Soho, Greenwich Village, Chinatown, and others. In Tokyo, the young hang out in Shibuya while the chic crowd gathers in glitzy Ginza. 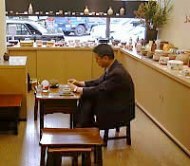 Ginza has a reputation of being incredibly expensive, possibly holding the title of the world's most expensive property; a small tatami sized plot can go for astronomical sums. So one would then conclude that any shop within it's eight block radius would logically have prices that help pay the rent. Not always the case though. 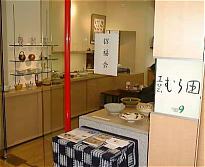 Kogei Murata is, as can be expected, a small shop in Ginza 8-chome, that sells top quality pottery at market value prices.  It's space is indeed small, one can cross it in three large steps, but it's also airy and bright. 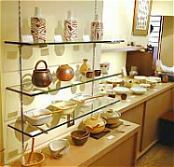 The counters and shelves, not to mention the classy show windows, offer enough space for gallery owner Muruta Shiro to put together special exhibitions of individual potters(7-8 times a year) or just to place some of his extensive inventory on. 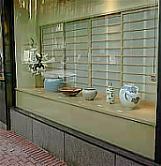 When I visited he was having his yearly sayonara sale and that's why the photos show a variety of wares. There was some nice Shino, Bizen, sometsuke, and Oribe(Photo 8) among other styles. 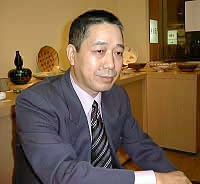 Murata-san has been involved with Japanese pottery for over thirty years and he has a pretty good eye for what's good and not. His tastes don't always converge with mine but then that offers me, sometimes, to discover potters whom I wouldn't have otherwise known about. Most often though I find something I like- this past visit it was a nice Bizen tokkuri for my personal collection by Michiaki Kaneshige. 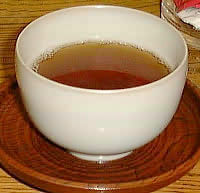 A nice cup of tea is always served for visitors and that sure felt good after walking around in the December cold of Tokyo. 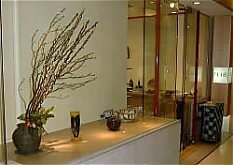 So, throw away the commonly held perceptions of Ginza and check out a place to find reasonably priced(reasonable being a relative term here- meant for those familiar with Japanese pottery prices) quality pots amidst the world's most expensive real estate.